WELCOME to Maranacook Area Youth Hockey! 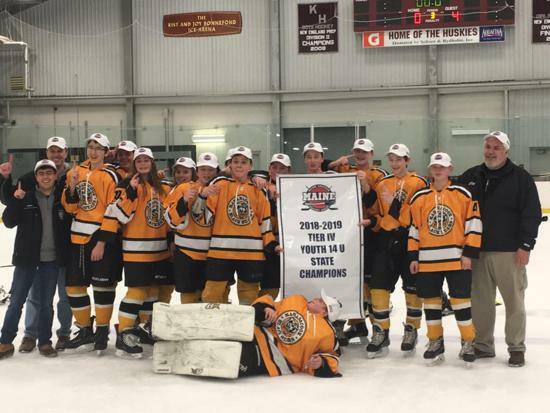 Congratulations to the 2019 State Champions Maranacook Bantam Team! Thank you to our 2019 tournament sponsor! The Little Bears Learn to Play Hockey program is a USA Hockey Cross-Ice Instructional program. All of our teaching and lesson plan materials are based on USA Hockey's American Development Model (ADM). This program is designed to be the natural progression to a Tier 4 Team. Each session of Learn to Play is $40. If you need equipment please email: lanceboucher@gmail.com. Rental equipment is available for $50/bag on a first come first serve basis. 2017 State Champions! Congratulations to our Tier IV Squirts! Great job! Support MAYHA when you shop at Amazon! Click to have a % of your Amazon purchases donated to MAYHA! ©2019 Maranacook Youth Hockey / SportsEngine. All Rights Reserved.